Baselworld beckons for those fortunate enough to stroll its treasure-lined displays showcasing the world’s finest timepieces. It’s a privileged gathering of watchmaking expertise that stretches back hundreds of years and assembles from across the four corners of the globe. So what caught our eye at Baselworld 2019? It’s hard to get all the favorites in, but here are the top contenders. Wow! This sleek new gem from the well-respected watchmakers resurrects a design from the 1960s when Tudor was commissioned to create a watch for the U.S. Navy. The watch never made it out of the workshop stage but decades later Tudor Black Bay resurrected the patent of this unique looking timepiece. Rather than stuck in the 60s, this watch exudes elegance with a modern sporty feel augmented by a strap that artfully blends leather and rubber. The design includes a unique locking bezel and is built tough to withstand water to a depth of 20 meters. Okay, so normally a Rolex Datejust wouldn’t grab much spotlight at Baselworld. Sure, the Datejust is a great piece that’s been pleasing watch lovers from an iconic perch in the pantheon of fine watches since its debut in 1946. But what makes this year’s entry so intriguing is how effortlessly it contours itself both to the old and the new with casual cool appeal. Take the classic Jubilee bracelet with an update in design that near seamlessly blends it into the case. Subtle with a width of 36mm, this won’t grab attention but those that do notice its sublime charm will note the steel and white gold combination that honors decades of heritage in the line. The fact that the black sunburst dial is backed by a power reserve of 70 hours means this classic is a keeper! Patek Philippe looks like they were out for a fanciful whirl at Baselworld and by all accounts they succeeded marvelously. The latest incarnation in the Calatrava line, Ref. 5212A, positively pops with retro positivity in a throwback to classic time-and-date models from the 1950s. This timeless dress watch, that stirs a bit of whimsy with its handwritten days and months, still strictly serves as the weekly calendar it was designed to display all those years ago. And we’re talking about a serious old school swerve with the use of high-finish steel. Eschewing Patek’s preference to use precious metals, this no-nonsense and multi-purpose beauty also ups the elegance with a soft calfskin strap. Maybe it’s something in the zeitgeist. Maybe it’s as deep as the universal desire to ease back into a simpler time, or something as basic as the cycles of fashion reaching back to re-appropriate. No matter how the designs merged, we were again taken back to aesthetic wonders of the 1950s with an exact rendition of a Breitling Navitimer from 1959. And we mean exactly! While the movement inside is a modern in-house hand-wound 12-hour caliber, the rest is completely adherent to the original design. From the iconic beaded bezel to the sleek 40.9mm steel case, this one pleases both vintage hunters and aficionados of the longtime favorite. Keen observers will recall that we were introduced to the Zenith Defy Lab in 2017. That limited-run watch crept into classic territory with a considerable technological leap due to its new oscillator in place of a traditional spring and balance wheel. That modern movement is back in a second limited-edition run dubbed the Zenith Defy Inventor, with an oscillating plate that whirs to put on something of a show when viewed through the crystal. TAG Heuer had no small task in mind when they set out to combine two worlds of watches: aviation and automobiles. The resulting Autavia does indeed capture both of these proving grounds that spawned the world’s greatest chronographs. Two years after the debut of that well-received Jack Heuer original design they’re back with the Autavia Isograph. This watch tells the world you think of function before fashion. Though, of course, you are fashion conscious but don’t have to shout it out if you’re sporting a classic TAG Heuer. This latest rollout also comes in a color combination that has been garnering attention. The bronze case with a smoke-green dial just exudes laid-back confidence and unique style. This is one that’s perfect from golf clubs and boardrooms to days out for carefree Sundays. It’s a design-splashed trip to the jetset fever of the 1960s with the Zodiac Aerospace GMT. Isn’t Zodiac now Fossil? Yes, Fossil did buy them. And no strikes against Fossil, they make some great stuff that often bests pricier competitors. But Zodiac has kept quietly semi-independent as they make a name for themselves in the GMT market. Based on a beloved design from the 1960s, the Zodiac Aerospace GMT is beefed up a bit with a 40mm case. As well as a two-tone bezel that’s retro-hued with orange and turquoise. In the $1,700 price range, this GMT should worry its higher-priced competition. Another @baselworldofficial hit! The @zodiacwatches Limited Edition Aerospace GMT Chronograph. “odiac originally created the Aerospace in 1966 as an evolution to the famed Super Sea Wolf. With a Swiss-made ETA2893-2 automatic movement, this reimagined, limited edition style is the pinnacle of expert timekeeping with a universal Greenwich Mean Time (GMT) tracker that allows you to tell time in two places simultaneously.” It appears the Gulf version is already sold out! Great suggestion @gratefulwatcher, thanks for the photos @revolution.watch! Alas, you will have to wait for the next big gathering. 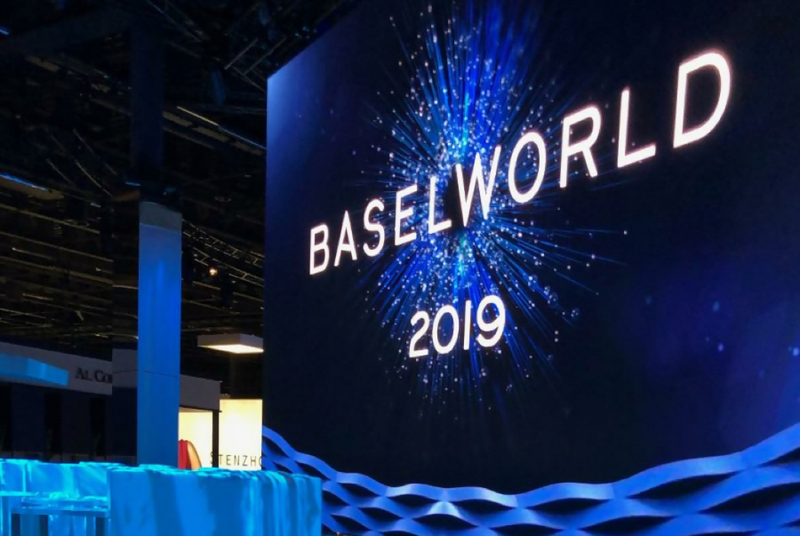 Baselworld 2020 will be back in its title town of Basel on the Rhine River on April 30, 2020. Until then you’ll just have to explore all of the 2019 offerings and simply dream of what’s in store.